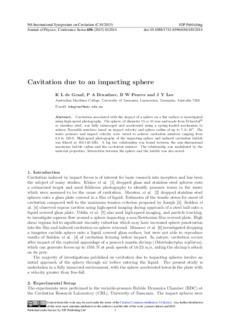 Cavitation associated with the impact of a sphere on a flat surface is investigated using high-speed photography. The sphere, of diameter 15 or 45 mm and made from Ertacetal® or stainless steel, was fully submerged and accelerated using a spring-loaded mechanism to achieve Reynolds numbers based on impact velocity and sphere radius of up to 7.2×104. The static pressure and impact velocity were varied to achieve cavitation numbers ranging from 8.9 to 120.9. High-speed photography of the impacting sphere and induced cavitation bubble was filmed at 105-140 kHz. A log law relationship was found between the non-dimensional maximum bubble radius and the cavitation number. The relationship was modulated by the material properties. Interaction between the sphere and the bubble was also noted.